Živković Samardžić, one of the Serbia’s leading full-service independent law firms, contributed to the Law Firm Network Global Employment Law – Fact Sheets. 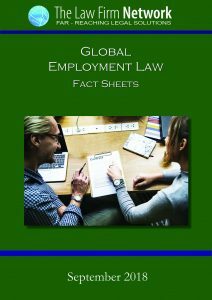 Global Employment Law – Fact Sheets is a unique publication comprising information on employment regulation in 35 countries across the globe, which has been created thanks to the joint efforts and close cooperation of the members of The Law Firm Network and their partner law firms. The systematic structuring of texts should give the reader a comprehensive idea of employment regulation, human resource costing and national specifics in different jurisdictions. Serbian chapter of the Law Firm Network Global Employment Law – Fact Sheets was prepared by Jovana Tomić, Živković Samardžić Employment Partner, and Ana Popović, Živković Samardžić Employment Senior Associate. You can download the Global Employment Law – Fact Sheets here, or at the Law Firm Network website at: https://www.lfnglobal.com/index.php/legal-guides#egfs.